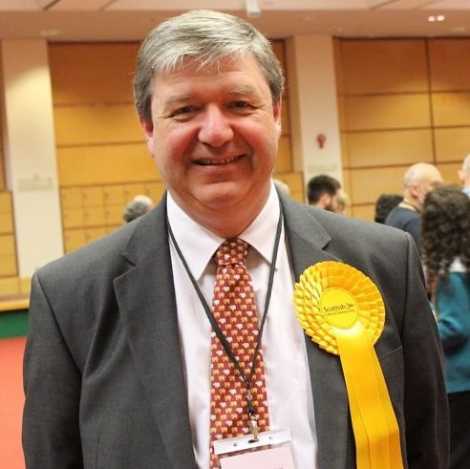 NORTHERN Isles MP Alistair Carmichael has attempted to bat off continued calls for his resignation, saying he “very much regrets” the position he finds himself in but insisting he will continue serving his constituents. The SNP has piled pressure on the Liberal Democrat MP after he admitted sanctioning the leak of a private government memo back in April in an attempt to smear Scotland’s first minister Nicola Sturgeon and then lying about it. On Saturday simultaneous protests – organised by those who campaigned for a Yes vote in last year’s independence referendum – were held. 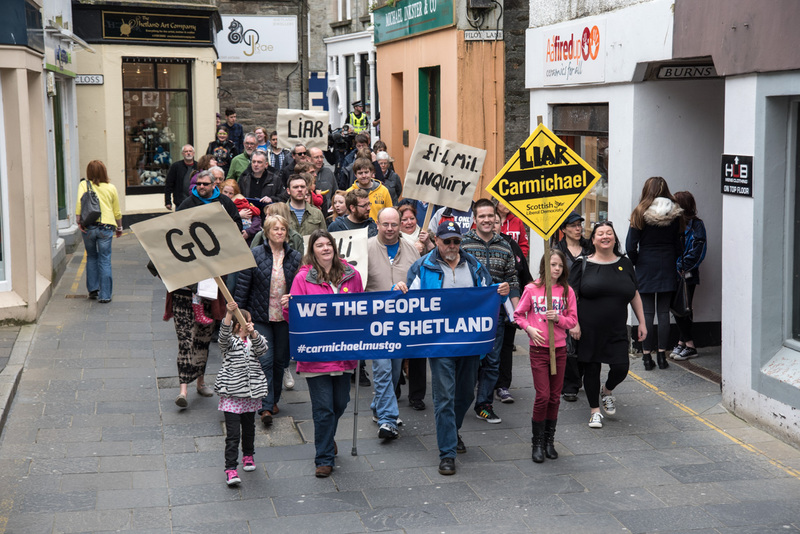 Around 50 people took part in the Lerwick town centre protest, while a similar number were out in Kirkwall calling on the MP to resign. Another protest is being planned for this Saturday (30 May). In a BBC interview broadcast on Monday morning – his first comments since apologising for his conduct on Friday – Carmichael said his task was now to “get on with doing the job that I’ve been elected to do as member of parliament for Orkney and Shetland”. “I have said already that I very much regret the position I am in,” he said. “I have been the member of parliament for Orkney and Shetland for the last 14 years. Carmichael said he saw “no reason” why the debacle should affect the work he does for constituents, adding that while he understood that “a number of people are disappointed”, he has also had a “great deal of local support”. Carmichael was due back in Orkney on Monday afternoon having spent the weekend attending a sporting event in Germany with his family. The SNP, whose candidate Danus Skene managed to slash Carmichael’s majority from 9,928 to 817 votes, has since Friday been calling for him to stand down and trigger a by-election. SNP activists firmly believe that, had the investigation into how the memo came to be leak been completed prior to May 7, it would have altered the outcome in Orkney and Shetland. Skene said on Monday that the issue was not the “unverified and rather scurrilous leak” claiming that Sturgeon would prefer to see David Cameron as UK prime minister rather than Ed Miliband. Skene added that Carmichael’s integrity was “in question” and he was not going to be able to deliver for islanders as a “discredited and isolated” backbencher. In his radio interview, Carmichael dismissed conjecture that the investigation into the memo leak had cost £1.4 million of taxpayers’ money as the “sort of story that tends to spring up in the age of social media”. Locally, the view that the MP should resign is far from being confined to those within the SNP, while – although Scottish party leader Willie Rennie has given Carmichael his backing – no local Lib Dems, including MSP Tavish Scott, have yet defended the embattled MP publicly. But others take a different stance. Shetland archivist and local historian Brian Smith – who has had political disagreements with Carmichael in the past – said he felt there was a “fox hunting atmosphere about the campaign” for him to resign. “This was a foolish ploy that was doomed to failure, but it is hardly by-election material,” Smith told Shetland News. “I have nothing at all against the SNP but an election victory in these circumstances wouldn’t be much [of a] coup. Meanwhile a statement issued by Maurice Mullay on behalf of the Shetland Conservative Association said many voters would be “extremely and understandably disappointed” at Carmichael’s admission, which local Tories “take on face value as an ‘error of judgement’”. “Alistair has been held in high regard as an effective and hard-working member of parliament for Orkney and Shetland and this revelation, especially from a lawyer, is hard to understand or reconcile. “The political scene in Shetland has regrettably seen dramatic changes during the past few years when some parties have not always acted in the honourable manner we would have normally expected.